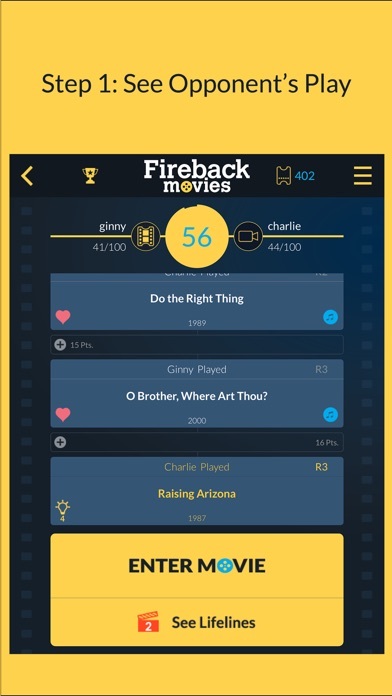 Fireback Movies is a new kind of movie trivia game in which opponents battle with their movie knowledge. All plays are movie names, and movies are connected by actors. You play a movie connected to mine, then I play one connected to yours. Opponents fire movies back and forth getting points for each play. It may take seven or more connected movies to reach 100 points and win the game. Fireback Movies is simple to understand but challenging and entertaining. Traditional trivia games ask random lists of trivia questions. In Fireback Movies, each player dynamically creates the challenge posed to the opponent on each turn. For example, if your opponent plays Boogie Nights, you could fire back Almost Famous (connected by Philip Seymour Hoffman.) There are limitless possibilities of finding one degree connections between movies using any actor. Fireback Movies is a casual game where players can take their turns when they want. Fireback Movies checks your connections by referencing its proprietary database of 250,000 movies. It knows when there is more than one connection even when you do not. When players take their turns, the app gives immediate feedback to support the option for rapid-fire play. The actors who connect movies are shown after each play. 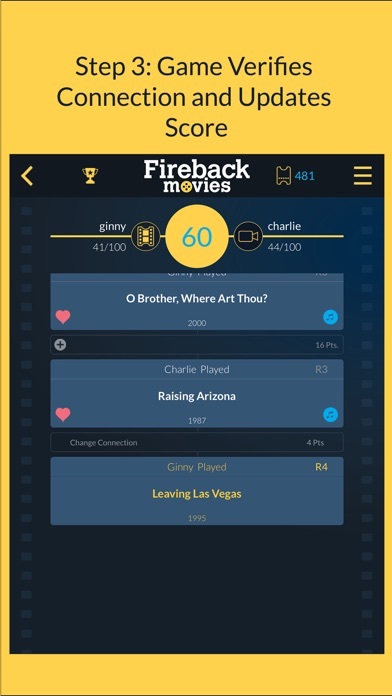 Unlike most trivia games, Fireback Movies lets you show your personality. In Fireback Movies, players play movies they are familiar with. As opponents reveal their movie knowledge, you learn about them. A game against one friend is a different experience from one against another. Plays in Fireback Movies are strategic. Some connected movies score more points than others. 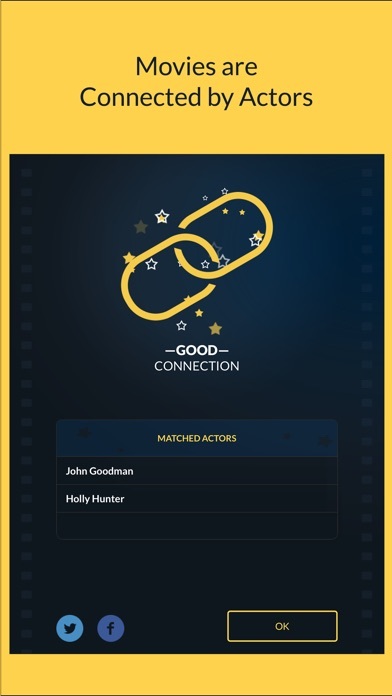 If you can play a movie with different actor connections from the last play, it is called a Change Connection and gets the most bonus points. Bonus points are also awarded for multiple actor connections and fast play. When players are stumped in Fireback Movies, they can use lifelines or pass. Lifelines are popular movies connected by popular actors that keep the game fun for both players. Fireback Movies is a freemium full-featured game with no limitations requiring purchases or advantages for people to "pay to win." 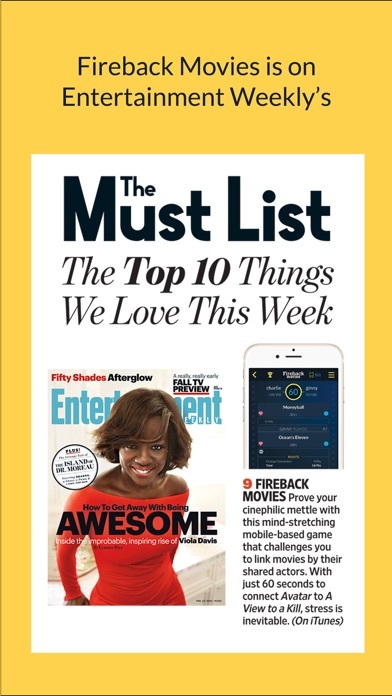 One Degree Games created Fireback Movies to give movie fans a new way to connect with each other by connecting movies! The BEST and ONLY game for my movie obsessed mind to play! Brando was not in Superman Returns and Bill Hader was not in Rush Hour 2. Also Rush Hour 1 and 2 did not share nearly the entire cast. Great idea but needs serious tweaking to be great! Definitely a must for any cinephile. You can keep a list of faves, but more importantly you can keep a list of "to see" movies. I haven't played that much and I forget a lot of info at times so I'm hoping this app will keep my synapses firing. It's doing a good job so far. Easy to use app. Game is fun to play and matchup helps keep the action going when friends are offline. I'd like to see a way to communicate with opponents. I really enjoy this game. The only problem I have is that it's hard to get all my friends to play and keep playing. I think expert movie buff Gregg Turkington would love it. Heard about this on the movie crypt podcast and it is a ton of fun. I upgraded already and it was well worth it. Really enjoyable game. Please build in some safeguards against cheaters: e.g. those who stop playing when it is evident that they will lose a game (the game should time out on them after x-days of no response), and those who are using IMDB to cheat. 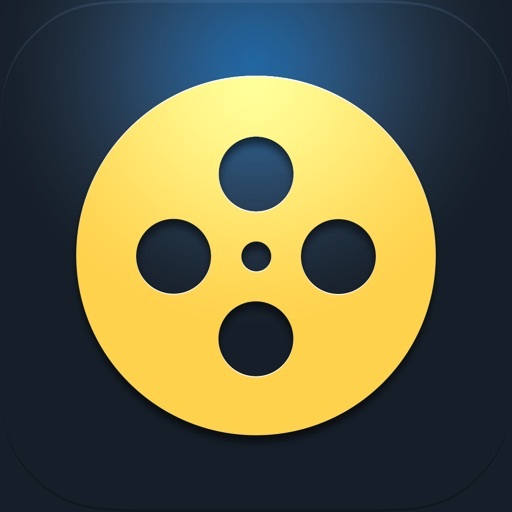 The perfect app for the movie addict like myself. Fireback movies is so much fun! The game can be made more or less challenging because you can choose to be timed or not. You can have as many games going as you want so you're never bored. I heard about this game on my favorite podcast The Movie Crypt, and I've been playing everyday since. If you love movies, you will LOVE this game! Great game! Very enjoyable and well crafted. The ads are annoying but that is easily resolved with $1.99. So far this has been AMAZING! Planning on playing this daily. A highly addictive app, full of fun. Would love to see directors added into the mix otherwise perfect. This game is fun and addicting! I was having an issue with the game and Charlie was very responsive and helped solve the problem. Great game and great customer service!! This is it!!! We've wanted a game like this for us movie nerds!!! And here it is. Love it!!! The perfect movie trivia game. It is super fun and well made. easy to use interface. will completely test your movie knowledge. super addictive and challenging without being frustrating. a very fun way to geek out about movies. Can't stop playing this game. I love the new version!!! It is so much easier to play for those of us that get stuck! This game is fun! It is frustrating to have to wait for other players to play. I have had several games going but only a couple of people play regularly and even then you usually have to wait at least 10 minutes or more per turn. Also I've gotten updates that I've been poked to play, but when I log in it says it's not my turn. But most frustrating is that some of movies aren't listed so you can't choose them, and some actor connections are wrong. UI is confusing. There is no way to leave a game once it has started. Database does not contain all connections. What a rush! by MovieMomma! This game is a blast and fun way to connect with friends. Probably one of the most challenging games I've played in a while. Addictive, but has real issues by shoegirl! This game is a lot of fun but the way it's set up makes it difficult to play. For one thing, I'm always playing the same people. It gets old really fast. Secondly, unless you win the game with an answer you never are alerted that you've won. I often just forget about the game especially because it's the same people all the time. Thirdly, one of the lifelines never works and I have no clue how to use all of my points. What do people use them on? This game could be more interesting if there was more at stake and the layout was more professional. Great game.. It would be neat if there was an option to raise the 'play to' score. What a great game for even people who don't like to play games! Like myself! Thanks for developing this ap for free! Love playing the game but way too many ads. Makes the game play too clunky and frustrating. Having fun playing against my movie buff friends, but the scoring is eratic and the "connections" often don't register correctly. Common movies don't show up in the search while the countdown clock keeps on ticking. Frustrating at times, especially since this game likely attracts movie trivia fans. Could be a great game but it's only OK. It is ok. Connections should include directors as well. The database needs an update!!! Who hasn't heard of Transylvania 65000??? And players should be able to send messages like on Words with Friends and Scrabble. Not sucked in yet. This game is fun and addictive for movie buffs! Its also fun to learn about actors and all the different movies in which they've had roles. Good for the brain too. Though it's not allowed a few genuine connections. Great app, it's addicting and I'm not a gamer app person at all but this has a large movie database that is constantly updating and there's always people to play against, hardly any waiting time at all unlike with other apps! Fun game for people who casually like movies and for movie buffs bc can choose opponent to set the difficulty! Addictive game - lots of fun. They need to update the database of movies. Have found quite a few common movies that weren't in there. And I've had problems with the app freezing up when I play too many games at once. If you get it, spend the $2 and get the ad free version.